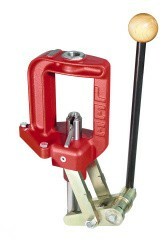 All Lee Presses feature compound toggle linkages. This permits full length sizing the largest magnum cases with ease. All have built in spent primer catchers, tough powder paint coating and detailed instructions. Under normal use all our presses will last a lifetime. For those that simply want best, you can't beat the "Classic Cast." They are the best money can buy. Make your press selection according to need rather than price. Single station presses will load nearly any cartridge. Cartridges are loaded in a batch process, which for example 20 cases are deprimed and sized then the die changed to seat bullets in the 20 prepared cases. This die changing process is sped up by the Lee Breech lock quick-change die system. Rifle case reloading is best accomplished on Single Stage Presses. For a beginner a single station press in a kit is the best value. Turret Presses offer single station simplicity and near progressive speed. No need to unscrew dies and on most models the turret advances to the next station automatically. Four pulls of the lever and you have completed a round. Perfect for moderate production of Handgun ammunition. When equipped with an Auto-Disk Powder Measure you can load 250 rounds an hour. Deactivate the Auto index feature and you can batch reload the longest rifle cartridges. Twist and exchange the turret, snap in a new shell holder and you're ready to load your next caliber. Progressive presses are for very high production of handgun cartridges. Add a bullet and pull the lever all other operations are automatic. Select a Progressive Press if you are shooting more than 500 rounds a week. Change over from cartridge to cartridge can be involved. 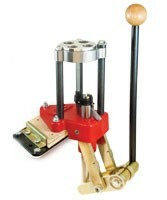 If you are loading limited quantities of many different cartridges a Turret Press is your best choice.